As my mobile phone had been offline during the hike, I had received a quite constant stream of text messages during the night. Again, the internationality of the whole trip amazed me. Our group included two Finns, one American, one South African and one Argentinian, and we were chatting in mixed German and English with two older couples from Hamburg. The SMSs I received came from different countries ranging from US, Finland and Russia to Thailand, most in Finnish but some also in English or Russian. In the morning we broke the camp and packed Rudi's car for the return trip. We discussed the route for a while with a 4x4 bus driver, but his only advice was to leave the Matebeng pass in southern Lesotho for goats. 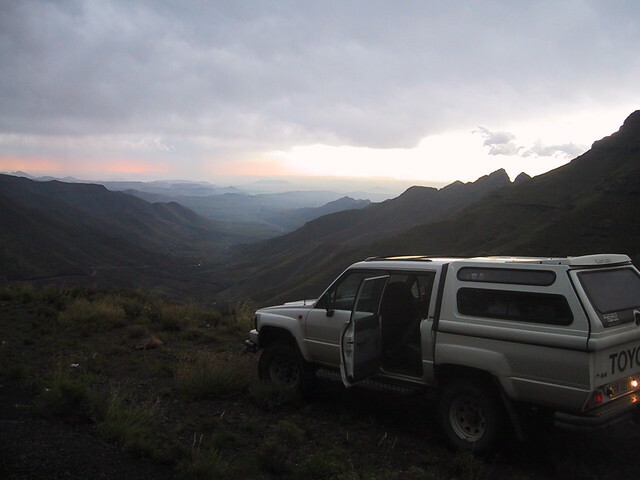 The gravel roads in the Lesotho highlands are rugged and twisty, broken with occasional stream or even a stone wall. We rode through several passes connecting valleys of breathtaking view filled with countless rondawels of the Basotho villages. Road signs were nonexistent so we had to navigate by checking distances of intersections with GPS and guessing which of the roads would be the right one. Only places marked with signs at all were the numerous primary and high schools, full of uniformed students listening to a lecture outside. Every now and then a Basotho hut would bear a white or yellow flag, indicating to passersby that they would have something to trade. Apparently yellow flag meant the availability of beer but the meaning of the white flag was left unclear. It would anyway have to be a commodity useful even in most rural areas, as some huts we had seen in the high mountains had also flown that banner. Some guesses included milk or gasoline. After hours of driving and a gas stop in a village where our tank was filled using an empty Coke bottle we came to Katse dam, the main point of the Highlands Water Project providing most drinking water and some electricity to the central South Africa. Near the dam the roads changed into good tarmac, to our big disappointment. We had tried unsuccessfully to buy ice from several places along the road for cooling our beer. When we stopped to a view point to take some photos of the dam, a fierce hailstorm started solving the problem. As the hailstones were very big we ran to shelter, listening to the very hard drumming sound they made against the tin roof of the visitor centre. After the worst hail had subsided we got outside, and started collecting the hailstones into our beer cooler. As the hailstones were quite dispersed and were being melted by the rain we couldn't get the cooler filled before having to drive on. After driving for a moment we came to a canyon where the hailstones from the cliffs had collected into larger piles. Laughing, we jumped out of the car to collect them. Then we noticed a larger pile laying miraculously on the other side of the road for no apparent reason, enabling us to fill the cooler easily. "Ice from heaven", we decided. As we drove on, we noticed that the local shepherds were quite prepared for such weather, as most of them were wearing construction helmets. The hailstorm turned into a most amazing thunderstorm, with lightning striking continuously around us for over an hour. We passed into the lowlands using the extremely beautiful Mafika-Lisiu Pass, and crossed the South African border at Ficksburg. We drove for a dinner in a nice Italian restaurant in Clarens and camped for the night in the Golden Gate National Park. Arriving next afternoon to Johannesburg provided a very striking contrast between the ancient Basotho huts and the tall modern office buildings of Jo'burg. In evening we went for a very nice dinner in a better-quality South African restaurant, enjoying exotic dishes like Kudu antelope.